You are never too old to begin your training in traditional karate! 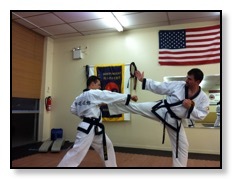 Our Adult & Teen Program, gives you many and exciting reasons to begin your traditional karate training. Our karate program for adults and teens utilizes a system of techniques that build strength, endurance, flexibility, posture, balance and coordination. All of this can result in positive changes in a pretty short time. Also there are the "non-physical" benefits to traditional karate practice. You can make changes in your body at any age. Karate practice includes exercises that are both aerobic and anaerobic helping you to lose weight and build strength. Also because of the dynamic nature and movement of karate and martial arts training you will see an increased improvement in mobility and flexibility. Through our system Bunhae Ki Sul 分解 術 / 분해 기술 we teach you how to effectively use the techniques you learn and apply them in actual self defense scenarios. 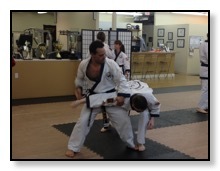 We’ll teach you how to strike with tremendous power and effectiveness. We give you skills to be able to defend yourself! We also teach how to identify dangerous situations and how to avoid them before trouble starts. Because of the aerobic component to karate or martial arts practice, your cardiovascular health can improve. You'll breathe better, sleep better, and have energy throughout the day! They have known this in the orient for centuries! The ultimate goal of traditional karate practice is to develop into a better person. As you begin to get into better shape and feel better about your self and appearance, your confidence grows with an improved feeling of self worth. 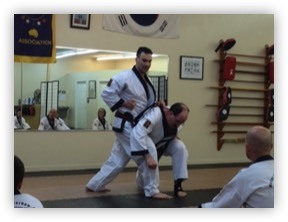 "Training and learning traditional karate has made such a positive impact in my life. I feel 10 years younger!" "As a woman, I feel confident that I can defend myself. 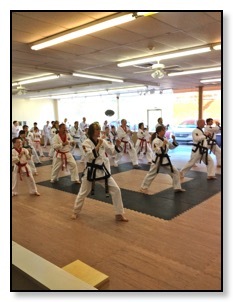 South Hills Karate has also given me so much more!" "I started practicing Tang Soo Do at age 73! I'm now 76 years old and continue to practice because it helps keep me young and I feel great!"